To obtain a good print your image file must be of a sufficient size to print successfully. 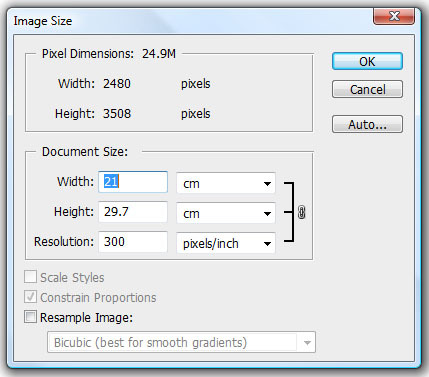 You can increase the resolution for any image by increasing the file size in Photoshop but if your image initially has a small file size then re-sizing will only work to a certain degree (10-20%). For example an image downloaded from the internet that appears on screen as a half page in a web document may only be approximately 800 x 600 pixels at a screen resolution of approx. 72 ppi (monitor resolution). If you printed this image at the standard printer resolution of 300 dpi it would reproduce at a size of just 5 x3.3 cm. so your 700k image would need to be sized up in Photoshop by 35 times and would look pixelated and awful. r with a white border. This will be created in a new A3 document that can be saved for printing on an ink-jet or uploading to Photobox etc. Go to Image / Image Size dialogue box, if Resolution is 300 ppi then skip step 4.
click OK. Note it is essential to click OK, do not go to step 5 without closing the Image size dialogue after changing the ppi. 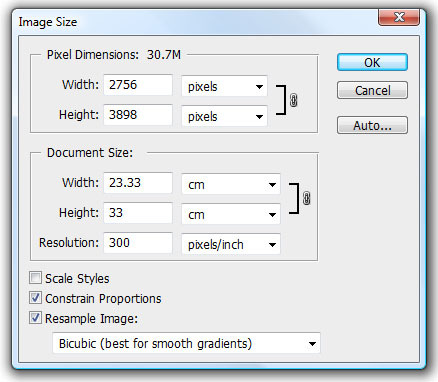 If you carried out step 4 or if your image was already at 300 ppi then open Image / Image Size dialogue and proceed as follows: check Resample Image and Constrain Proportions, enter 33cm into height box. Note before you click OK there is a pull down menu at the bottom of the dialogue box which defaults to “Bicubic Smoother (best for enlargement)” you have some advanced options here but the default is usually ok for most images. Click OK.
Go to – Select / All and then – Edit / Copy. This copies your resized image to the clipboard. 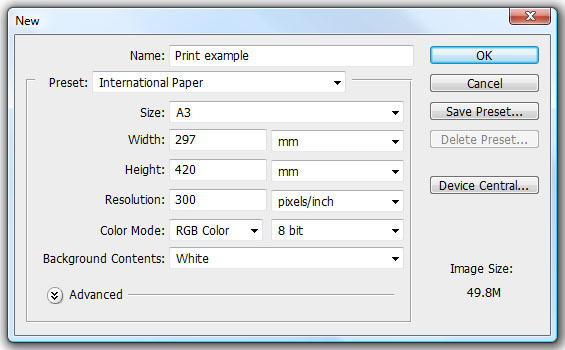 Go to File / New and choose International Paper in the Preset box, selecting A3, check you have 300 pixels/inch entered in the Resolution box, Color Mode is set to RGB Color, 8 bit. Choose White in the Background Contents box, you can give your new document a Name in the top box. Then click OK. This creates a new A3 document with white background. Note the instructions have been for Portrait paper orientation, you will have to modify for Landscape mode. With your new document open and “active” you can now go to Edit / Paste, this will paste your re-sized image in the clipboard to your new document, note Photoshop will automatically centre the clipboard contents in the new document. Go to Layer / Flatten and save your new file as a suitable file (PSD, Tiff or Jpeg if no further work is required on the image). You now have your A3 document with a central image and white border, this can now be printed at 300dpi. If you are planning to use Photobox etc. then it is best saved as a jpeg with compression of about 9 or 10 to make a reasonable file size to upload.